Ubajara is a small town in the northern part of the state of Ceara, about 200 miles from the capital city. 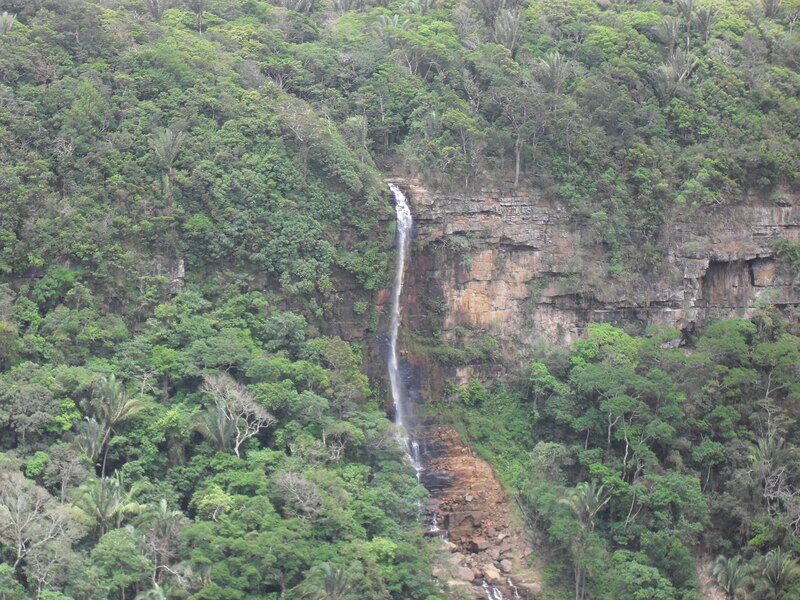 It is located on Ibiapaba Heights about 800 meters above sea level. It is known for being home to Brazil’s smallest national park that houses the world-famous Ubajara grotto and several scenic waterfalls that can be reached by walking through the forest. When we decided that we’d visit the region, I set off to look for a hotel there. I knew about a couple of places there (I’d been to Ubajara in 2000), but few could be reached online. I was able to contact Neblina Park Hotel via e-mail and made arrangements way ahead of time. When we reached Fortaleza, I immediately called the hotel, confirmed our arrival and set out to get bus tickets for the both of us. videos I’d previously loaded to my iPhone before we left. minibar, Wi-Fi and a spacious bathroom. white rice and fries. The food was tasty and fresh – but this being a hotel, I felt it was a bit overpriced. After we dined, we walked back to the town to buy bottled water and other necessities, and briefly walked around to get to know the area. every day. After polishing off a couple of shots of cachaça, we walked back to the hotel and retired for the night. The next morning we woke up early for breakfast (hotels in Brazil are required to serve it as part of the fee). It was weird to be the only ones there. The food was simple – bread, cold cuts, cheese, fruit, coffee, milk, pastries and juice – but it was tasty. We then ventured to the National Park to visit the grotto. After paying a nominal fee of about $ 3, we waited for the cable car. There was a loud group of tourists from a nearby city there as well, so we all took the ride together. Renata was freaking out a bit, because she feels a bit uncomfortable in these concoctions – she was just as uneasy when we visited Sugar Loaf Mountain in Rio in 2009. However, she kept her cool and in about a minute we reached the entrance of the cave. hear the noises from where we were. In order to receive visitors, the grotto has artificial illumination controlled by the guides. At one point, he turned off the lights for us to realize how it really is in there – pitch black, with no absolutely no sunlight visible from the inside. The story goes that when the park was inaugurated in the 1950s, explorers found skeletons of people who most likely got lost there – and who were never able to find an exit. fermented beverage made from cashew juice. We found a simple restaurant to have lunch in – it is basically someone’s home that was converted into a no-frills restaurant (we only found out because there was a small sign outside the property). with no sauce. It was so good that we came back the next day. We returned to the park the following morning to walk the trails that lead to two scenic waterfalls in the area. We were again aided by a guide – trails were open before, but after a couple of incidents (one involving a Polish visitor who tragically fell to his death from one of the falls), guides became mandatory.